How Laughter Prevents Heart Attacks ! 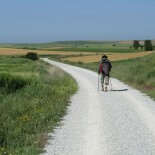 I had the privilege last month of participating in Australia’s first ever national gathering of Camino aficionados . Camino pilgrim groups in this country have been meeting in their own cities (Australian Friends of the Camino lists no less than nine separate groups in various Australian cities that meet regularly to catch up, socialise and support those who have walked or plan to walk the Camino de Santiago). However, there has hitherto been no national gathering such as happens annually in the US – where the American Pilgrims on the Camino group (APOC) held its 20th annual gathering in Hampton, Georgia from March 23rd to 26th this year. This is where the folk from the Blue Mountains -Rowan, Margaret, Tony and their team – stepped in , and organised the first ever AusCamino Festival in Australia. Held over four days from February 23rd to 26th 2017 in the picturesque Blue Mountains west of Sydney, the event attracted over two hundred Camino enthusiasts (perhaps we should describe ourselves as “Camino tragics”!) who were treated to talks, walks, workshops, EXPOs, hospitalero training, Spanish cooking classes – plus the opportunity to share meals and a glass or two of vino australiano while enjoying congenial company in those beautiful surroundings. The main event was preceded by two days of hospitalero training, which enabled several of the attendees to obtain their certificates as hospitaleros/hospitaleras so they would now be able to serve other pilgrims in albergues along the Camino. On the Saturday we were treated to a series of talks – a masterful summary of the origins, history and significance of the Camino by Marc Grossman, followed by an informative presentation by Janet Leitch OAM, Chairman of the group Australian Friends of the Camino (AFotC). There were useful presentations about what and how to pack for the Camino – and the sensible medical and other precautions one should take for one’s journey. Among the talks I most enjoyed were those by authors Sue Regan Kenney from Canada and Bill Bennett from Mudgee, NSW – and by Tim Wainwright who did not walk but kayaked the Camino! For those participants who have walked the Camino de Santiago and for those who plan to walk the Camino in the future, the AusCamino Festival provided a most interesting, informative and enjoyable four days in the Blue Mountains . I am sure there was much hard work put in by Rowan, Margaret, Tony and their team – for which all of us who attended would be grateful. I do hope this AusCamino Festival 2017 will be the first of what will become an annual event! 3. Blue Mountains National Park. This entry was posted on March 21, 2017 by Dr. Sanjiva Wijesinhahttp://wordpress.com/wp-admin/user/admin.php?page=grofiles-editor in Uncategorized.